Having just released his chart-topping new album G I R L this week, and with the single, “Happy” (from Despicable Me 2), breaking sales and chart records around the world, Pharrell Williams has announced a partnership with the United Nations Foundation to celebrate the annual global International Day of Happiness, Thursday, March 20. In addition to a 24-hour event on YouTube, Pharrell invites people everywhere to take action and help raise money for humanitarian efforts around the globe. 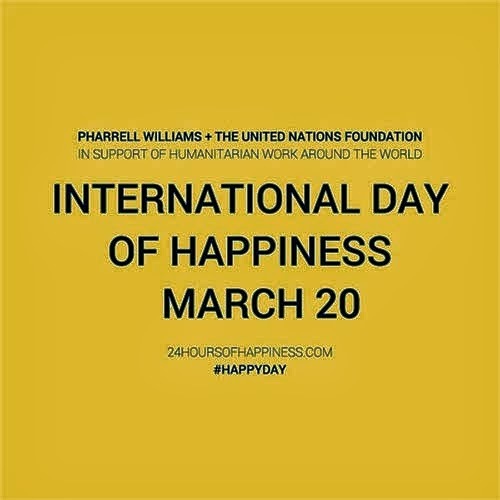 Drawing inspiration from the “Happy” videos fans worldwide have already posted, starting this coming Monday, March 10, Pharrell encourages all his fans to post YouTube videos of themselves demonstrating their happiness to his global #1 smash hit "Happy" with the hashtag #HAPPYDAY and then register their submission at http://24hoursofhappiness.com. At noon on March 20 in each time zone, Pharrell will spotlight the best submissions on the site. Fans are also encouraged to use #HAPPYDAY throughout all social networks. As part of this global digital engagement, people will be reminded that everyone deserves a chance at a happy, healthy life, and encouraged to make donations to support UN humanitarian efforts designed to increase those opportunities for the people who need it most. Donate here.